A common cause of patient going to the hospital is kidney stones. Some will develop kidney stones only once in their life, others will be called stone former due to the recurrent formation of kidney stones. Kidney stone disease is the third most frequent urinary tract disease after urinary tract infections and prostate pathologies. It is not often that patients ask ‘what are kidney stones’? Rather, patients tend to ask how did the stones get there? Something which patients do not consider is that these questions have an immediate relationship. Kidney stones are solid phase materials found in the urinary track, which is composed of insoluble salts of great chemical differences and complex pathophysiological origins. These salts often have several names, for example, struvite which is composed of magnesium ammonium phosphate is named after a Russian naturalist called von Struve. However, before von Struve studied the salt was called guanite because it was frequently found in bat feces. Other salts with several names are those composed of calcium phosphate, which can be known as apatite (basic calcium phosphate) from a Greek word meaning to deceive. Another calcium phosphate salt is brushite (calcium monohydrate phosphate), named as such in honor of Professor George Jarvis Brush. Another kidney stone salt with an eponym is weddellite, named as such becausecalcium oxalate dehydrate was found in the Weddell sea in Antarctica. It is important to recognize these eponyms because their use in thescientifical literature about kidney stones is frequent. One of the first steps when studying kidney stones is classifying them. 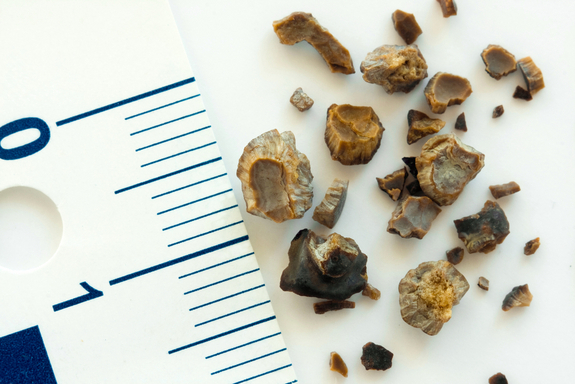 Kidney stones can be classified by location, shape, and chemical composition. The location in which kidney stones can found is in the kidneys, the ureters, and the bladder. Within the kidney, stones can be found either in the pelvis or calyces. In the ureters, kidney stones are classified by location as proximal, medial and distal. From this classification, we can see that the first half of the name, kidney stones, is a misnomer, as stones can found across the urinary tract. Also, the second half of the name, kidney stones¸ does not represent the true diversity of these solid materials. Respecting shape, they can be classified as staghorn or non-staghorn. Staghorn stones are those that fill several major and minor calyces in the kidney. Logically, all staghorn stones are found in the kidneys. In contrast, non-staghorn can be found in the kidneys, ureter, and bladder. The final aspect in the classification of kidney stones is the chemical characteristics that differentiate each type. The major chemical compositions divisions are calcium stones, uric acid stones, struvite stones, and cysteine stones. Calcium stones can be further divided into calcium oxalate stones and calcium phosphate stones. There are also mixed stones which can be composed of crystals from different divisions or subdivision, for example, there are mixed calcium stones (calcium oxalate and calcium phosphate) and there are mixed calcium-uric acid stones. Additionally, there are uncommon types of kidney stones such as ammonium urate stones and drug stones. Each classification of kidney stones has clinical relevance. For example, the shape, location, and chemical complications of kidney stones will define the clinical manifestations, the natural history, possible complications and the corresponding treatment. However, the chemical composition will also provide the physician with evidence of the possible mechanism that originated the stones. The mechanism in the formation of kidney stones will determine its location, shape, and chemical composition. These mechanisms are complex and have not been defined. However, their several theories to explain the formation of kidney stones. All which follow some general mechanism of stone formation but, at the same time, will vary according to the type of kidney stone. The current understanding and models of the mechanisms in the formation of kidney stone incorporate the concept of supersaturation and loss of modulators in three main theories, plaque formations, growth plug and free phase. It is important to recall that urine is the result of the filtration of blood. Therefore, most of its substances should be soluble. The puzzling question in the formation of kidney stones is why do substances in a soluble state transform into a solid state. The first concept, supersaturation refers to increased levels of dissolved salts in urine. A process which raises the concentration of salts in urine will result in supersaturation and increase the risk of kidney stone formation. The second concept refers to the decrease of physiological substances which regulate the growth and formation of crystals. In some case, during kidney stone formation¸ these substances are insufficient in quantity and their absences contributes to theformation of kidney stones. The mechanism in which these concepts are integrated has adirect relationship to the specific chemical composition of kidney stones. Therefore, it is useful to review them in relation to the chemical classification. Most kidney stones include calcium crystals, either as single calcium crystals (15-35% as calcium oxalate and 5-20% as calcium phosphate), as mixed calcium crystal (40-45%) and as mixed calcium-uric acid crystals (2-5%). Additionally, kidney stones are composed of about 2-10% non-crystalline materials. These materials include frequently include diverse proteins, hexoses, and hexamine. However, the presences of these do not define the chemical classification of kidney stones. Calcium kidney stones are formed as the result of the supersaturation of constituents of the stone. Diverse biochemical alterations can be associated with this process, such as hypercalciuria, hyperoxaluria, hyperuricosuria, and hypocitraturia. These biochemical alterations can be associated with certain types of crystals but usually are not specific. Calcium oxalate in kidney stones can be associated to either idiopathic, hypercalciuria, hyperoxaluria, hyperuricosuria or hypocitraturia. Most cases will be diagnosed as anidiopathic cause due lack of relevant findings. The rest of the underlying causes can be associated with diverse disorders related to nutrition, genetic defects, metabolic alterations, and many others. Also, calcium oxalate is linked to the plaque kidney stone formation theory. This plaque frequently referred to as Randall´s plaque was first described in the 1940s by Alexander Randall. This theory postulates that, in the thin Henle loops, lesions of the membranous membranes by crystal cause the supersaturated to accumulate. Progressively the accumulation of crystals leads to the formation of calcium oxalate kidney stones. Another type of calcium kidney stones is constituted by calcium phosphate, found as apatite (commonly hydroxyapatite) or brushite (calcium monohydrate monophosphate). Brushite containing stones are highly associated with the kidney stone plug mechanism of formation. This theory postulates that plugs of brushite accumulate in the terminal collecting duct and injure epithelial cells. Conditions such as high urine pH, hypocitraturia, and diverse types of distal renal tubular acidosis are high associated with calcium phosphate crystals. However, the disease with the highest association to calcium phosphate and best explained in terms of the physiopathology are hyperparathyroidism (frequently as primary but secondary cause exist too). Hyperparathyroidism causes many biochemical imbalances associated with kidney stone formation, such as hypercalciuria, hypophosphaturia, and alkaline urine. It is important to mention that of stone formers have primary hyperthyroidism. Other types of kidney stones include the infections kidney stones, mainly composed of struvite (magnesium ammonium phosphate). The formation of these stones is the result of urinary tract infections by urease producing bacteria. As a result of the degradation of urea, great quantities of ammonium are produced resulting in the production of alkaline urine. This creates anenvironment susceptible to stone formation. Additionally, the inclusion of other constituents can occur and these include brushite and calcium carbonate. The last group of kidney stones reviewed are the cysteine containing stones. Cysteine is a dibasic amino acid, created by the complexation of two cysteine molecules. Normally cysteine´s concentrations are low and unable to form kidney stones. However, as the result of a hereditary defects cysteine can occur due to the malfunction of cysteine reabsorption. These stones tend to appear at a young age within the first decade of life and are described as large, staghorn, and bilateral. Recently new association between kidney stones and other conditions have been made, which include cardiovascular disease, obesity, diabetes, dyslipidemia, metabolic syndrome, and calcifying nanoparticles. Amongcardiovascular diseases associated with kidney stones, we can list hypertension, atherosclerosis, and myocardial infection. Several studies have associated increase in therisk of apatient with these diseases of forming kidney stones. Nevertheless, studies need to be made in order to understand the pathophysiology. Particular, hypertension is an interesting case because the association is said to be bidirectional, in which sometimes hypertension precedes kidney stones and in other kidney stones precede hypertension. Obesity, diabetes, dyslipidemia, and metabolic syndrome, which have adirect relationship with each other, have been linked to kidney stones. The diagnosis of any of these disease increases the risk of kidney stone formation. Many theories have been proposed to explain this link, which includes the inflammatory components and susceptibility to an increased uric acid production. Another interesting condition associated with kidney stone formation is the presences of calcifying nanoparticles. Calcifying nanoparticles were discovered cell culture contaminants and found in human and bovine blood. They are characterized by having cytotoxic properties along with carbonate-apatite formation behaviors. However, much is unknown about these particles. Some researchers claim they are living organism due to their self-replicating behavior. Other say they are just bio-crystal molecules with life-life behavior. This is a review of the essential parts of defining what kidney stones are. Anyone studying these abnormal finding must recognize that first of all it the appearance of an abnormal substance in the kidneys. Solid substances as such are only physiologically found in the bone and occasional calcification in the body elsewhere. However, due to conditions of supersaturation, the absence of stone formation inhibitory molecule and diverse formation processes, these solid substances can form in the urinary tract. These variations are the result of the diverse mechanism and biochemical alterations in kidney stone formation. They are variations of great clinical importance because they will determine the clinical course of the disease and its therapeutical management. All of this oriented to solve one of the most common complaints, pain. Any physician who seeks to treat adequately patients with kidney stones must master many characteristics of the kidney stones such as the location classification. The location of kidney stone will determine the diverse manifestation that can appear along pain. Also, the characteristics of the pain will be determined by the location of the pain. For example, stones found in the kidney will manifest vague flank pain. In contrast, stones in the ureters according to their location, proximal, middle, and distal, will manifest discrete flank pain or anterior abdominal pain. The importance of the location is a reminder that the term kidney stones can be considered a misnomer, as they can originate from any portion of the urinary tract. If someone seeks to use better terminology, they can to refer to this condition as urolithiasis. This term does refer to the diverse possibility of locations within the urinary tract. However, the person studying this disease must keep in mind that this term only describes only a part of this disease and does not make reference the numerous pathological processes involved.